The Accu-Scale 220 is a simple, highly sensitive infeed system that accurately weigh-counts small parts. Designed for use with the Autobag AB 180™ bagger, the Accu-Scale 220 provides a complete, semi-automatic weigh count packaging operation. Utilizing the very latest technology, the Autobag Accu-Scale 220 is capable of detecting and counting small parts as light as 1/10th of a gram in weight. Simply place a sample of the product to be counted into the tray, and the scale virtually programs itself to count the product accurately. As more products are added, the new weight is instantly measured and the piece count is displayed. Once the desired amount is reached, a foot-pedal-operated flip-tray dispenses each batch into a pre-opened Autobag plastic bag. This system can also be used in a traditional scale mode for direct weight measurement and dispensing. A new target range feature enables even greater control of weigh counting accuracy by preventing cycling until the pre-set tolerances are reached. Simply set the upper and lower targets using the touch screen control, and cycling will be enabled once the weigh-count value falls within the pre-set range. This new range limit feature allows even greater control of weigh counting accuracy. 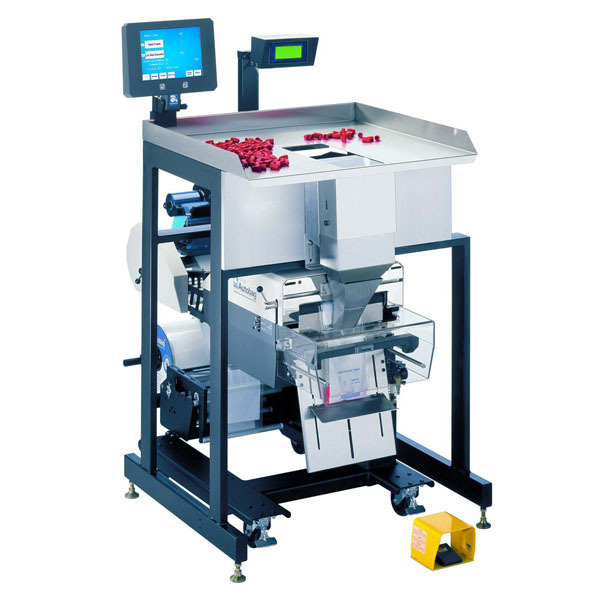 Using system matched Autobag pre-opened bags-on-a-roll, the Accu-Scale 220 offers a fast and effective, semi-automatic, weigh count and bag packaging solution.